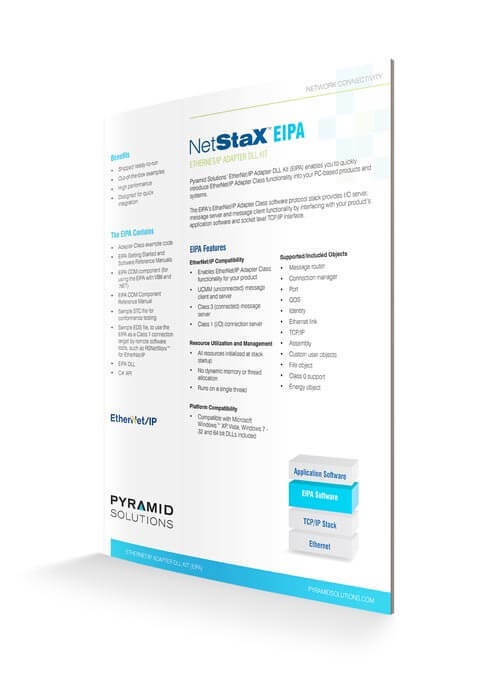 NetStaX™ EtherNet/IP™ Adapter DLL Kit (EIPA) enables you to quickly introduce EtherNet/IP Adapter Class functionality into your PC-based products and systems. 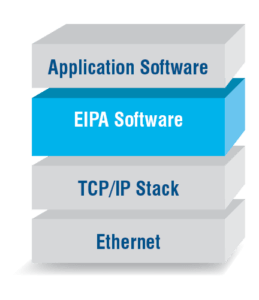 The EIPA EtherNet/IP Adapter Class software protocol stack (packaged in a DLL) provides I/O server, message server and message client functionality. The EIPA software provides an application programming interface (API) for using Common Industrial Protocol (CIP) via TCP/IP. The EIPA software interfaces with your product’s application software and Windows standard (Winsock) socket level TCP/IP interface.